The total distance of our route was 56.06 miles (91.09 km). We stayed at Manee Sakha Hotel for 450 baht. It was a very clean hotel with big rooms, good wi-fi, hot water and AC. 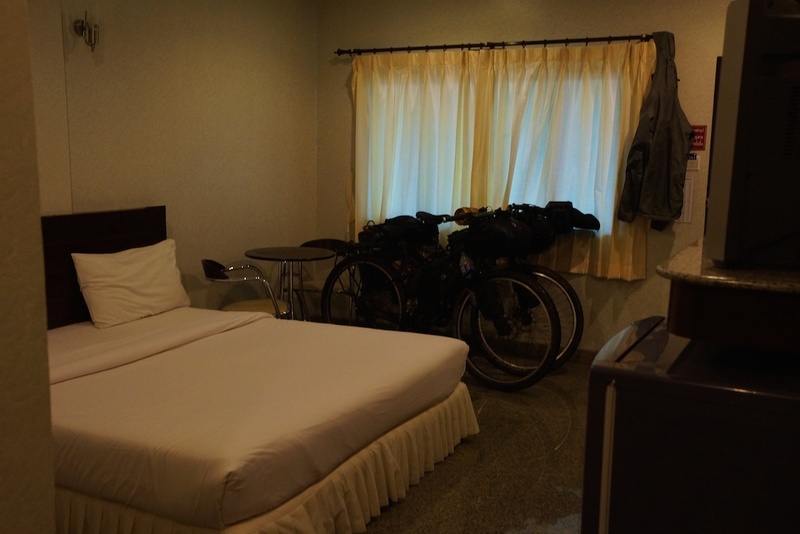 All of the rooms are on the first floor, so we wheeled our bikes right into the room. We stopped at 7-Eleven for a small breakfast and coffee on our way out of town. For lunch, we stopped on the side of the road for chicken, rice and papaya salad for 170 bhat. For dinner we went to a local restaurant across from 7-eleven and ate 2 dishes and 2 ice cream cones for 180 bhat. One night at Manee Sakha Hotel and our meals cost us 930 baht. Altogether, we spent around $29.17 USD in Sangkha.